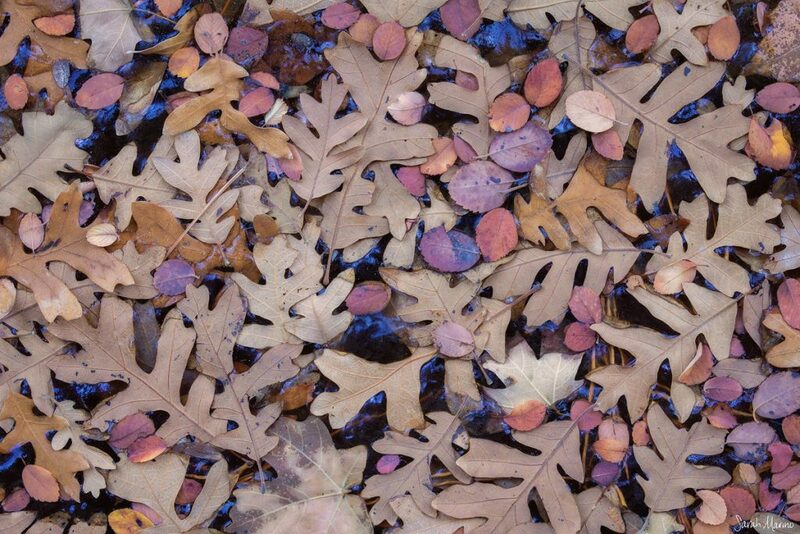 Autumn leaves find a resting place in a small frozen pool covered in iridescent film. Soon after the new NPN site launched, Youssef Ismail posted a discussion topic about “slow photography” and an interesting discussion ensued. I found myself agreeing with many of the points and practices shared by others in the thread, primarily because my own photography practice has evolved in this direction over the last few years. I now find myself practicing photography at a much slower pace as a more explorative, contemplative pursuit. With these changes, I find photography to be more enjoyable, my photographs to be more meaningful, and my portfolio to be more diverse and fully representative of the places I spend time. Below, I share some of the lessons, practices, and habits that helped my practices and photography evolve in this direction. One particular trip sticks in my mind as a moment of realization that my then-frenzied approach to nature photography might not be serving me well. My husband Ron Coscorrosa, also a nature photographer, and I were in Utah’s Zion National Park. We had visited most of the icons in the park and were feeling antsy and ready to move (reason: a forecast full of clear skies). We drove overnight to Death Valley National Park with the intention of photographing Badwater Basin at sunrise. In departing Zion, I had a specific vision for the photo I was going to take at Badwater the next morning – clean, white salt polygons (perfectly composed!) with a colorful, preferably pink sky overhead. After that, we would head to the Racetrack where I would photograph one of the park’s famous sailing stones, again with a colorful sky overhead. Since Death Valley is a massive park and our two destinations are far apart, there would be little time for anything but sunrise and sunset photography. We would arrive at each location without much time to explore but enough time to check off another place off the list. After finishing at the Racetrack, we drove back to Zion with the hope that some more interesting weather might roll in. We spent a little more than 24 hours in Death Valley. 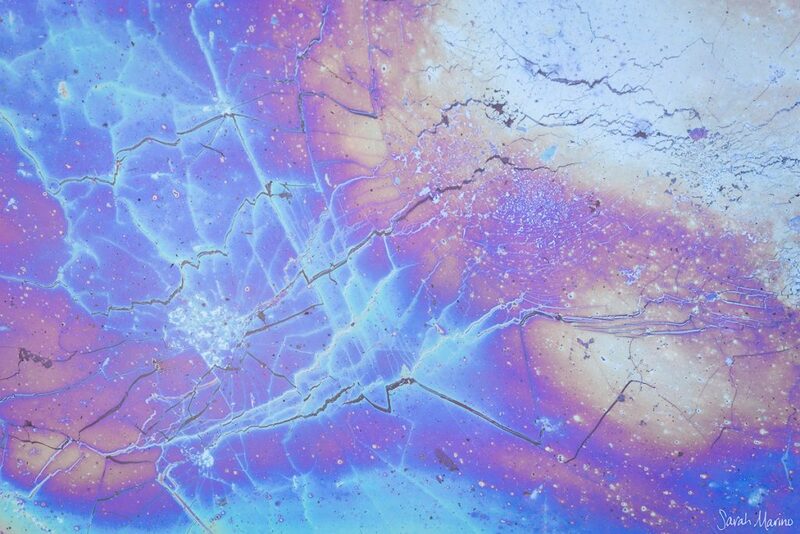 Iridescent film coats a small pool of stagnant water, with small fractures in the film creating fascinating patterns. Together, we pursued nature photography in this way for a few years and it was thrilling and intense at times. It was also exhausting and ultimately unfulfilling. If my pre-existing ideas for a spot didn’t work out, I would be disappointed and frustrated. I often found myself wondering where a trail might lead or what the view might look like from the top of a hill but never had the time to put into such explorations. Looking at weather forecasts and then chasing them became tiresome, especially since the forecasts rarely panned out as expected. In 2014, we bought an RV and due to the more cumbersome nature of this style of travel, found ourselves forced to stay in places for longer than we would have under our previous mode of travel. At first, this felt quite constraining because I felt the constant pull of the next place. I rarely had a good reason for wanting to move on but had become so accustomed to movement and speed as a driving force for my photography that standing still felt like wasting time. After a few slower trips, the feeling of constraint faded away and I started to appreciate staying in one place for a long stretch. With more time, I could toss the result-oriented checklist, slow down, get beyond the obvious spots, and learn to work with (and enjoy!) less than ideal conditions. 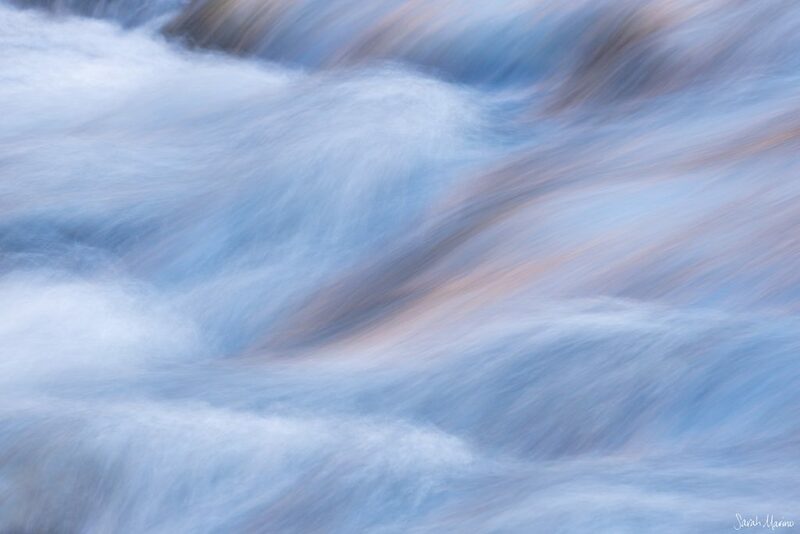 A range of overlapping terms has evolved to capture this way of practicing photography: slow photography, meditative photography, contemplative photography, experiencing flow, and others. For my own photography practice, I have taken ideas from each of these approaches and formed them into a set of habits that work for me. Since none of these terms perfectly captures my own approach, I instead think of my field style as photography by wandering around. I like this categorization because it captures some key ideas: exploring without specific goals or expectations in mind, taking a slow pace, seeking to see beyond the most obvious features of a landscape, and enjoying the process regardless of the results. I found the following four practices to be especially helpful in cultivating this slower approach to photography. Soft cascades in the Virgin River catch reflected light from the sandstone cliffs high overhead. We recently returned from a two-week trip to Zion National Park. The drought affecting the American southwest left some of the trees brown and dull. Skies were clear almost the entire time we were in the park and the clouds that did appear were more contrail-like than cloud-like. The wind seemed relentless on many days and the temperatures were oh-so-cold. And, to continue the trend of the last few years, the park felt oppressively busy. All of this is a recipe for a miserable photography trip, right? If I had a checklist of grand landscapes featuring prime fall colors that I hoped to photograph, this trip likely would have felt like a failure. A photographer friend often shares another illustrative story about a student on one of his workshops, which was taking place during peak fall colors in the eastern US. I always think about this story when discussing this topic because it is such a dramatic example of how expectations can eliminate opportunities and stifle creativity. The student came to the workshop with the goal of photographing waterfalls. The conditions were not conducive to photographing waterfalls but were excellent for forest scenes showcasing the fall colors. The student ended up leaving the workshop early because she couldn’t see past her expectations while the rest of the participants enjoyed one of the best autumn seasons in memory. Thus, try to go into a trip or outing without expectations or pre-conceived ideas about a place or the photos you hope to take. Approaching a place with an open mind helps you see what a landscape has to offer during your visit, not the idealized version of a place you might have cooked up in your mind after viewing the best work others have created in the place you are visiting. This approach can help you see a place in fresh ways, gain insights that wouldn’t be possible with a checklist or lots of ideas already in your mind, and open up opportunities to take advantage of serendipity. I find that one of the best ways to go with an open mind is to avoid looking at photos of a place in advance of a trip. With this practice, I do not have other people’s ideas crowding my mind when I start working on my own photographs. I also try to actively quiet my ideas about what I expect and instead arrive open to the conditions present at the time (replace “I hope that patch of maples is still colorful” with “it will be interesting to see how the trees in that canyon look this year”). During our time in Zion this year, we chose a few general areas that we wanted to explore and then set aside time for wandering around without a plan, specific goals, or expectations for what we might find. The photos in this post are a result of that process. I didn’t arrive in Zion expecting to photograph frozen pools filled with leaves or curled up, peeling mud but that is what we found so that is what we photographed. In comparison to previous trips to this park, I feel like I connected on a deeper level with the landscape than I had before and enjoyed the process of photography a lot more. Arriving with an open mind significantly contributed to this more positive experience. 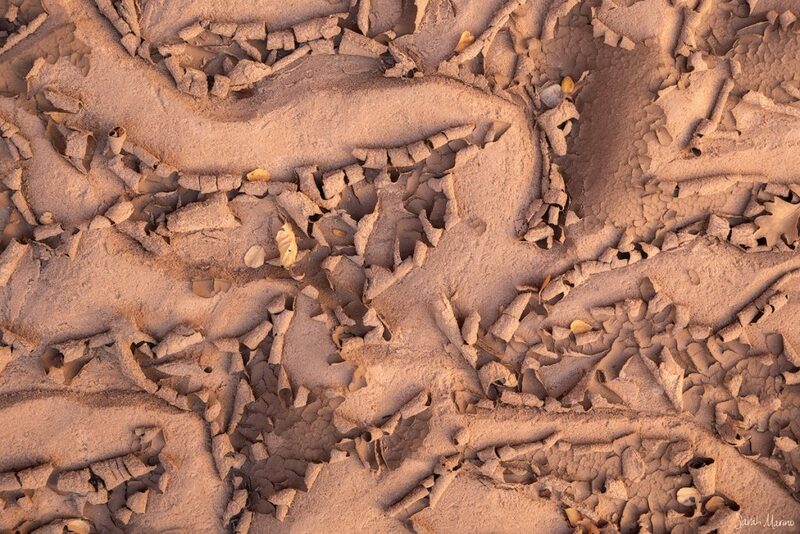 A flash flood created ripples in mud and sand in a narrow canyon. These curls formed after the top layer of mud dried out. 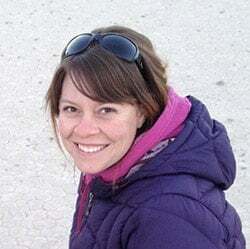 During our trip to Zion, we met up with NPNers David Kingham and Jennifer Renwick with the intention of hiking the length of a canyon as a shuttle hike over the course of an afternoon. The hike would be about six miles long and we planned to photograph as we went. We all seemed a little stressed, knowing that we had many miles ahead and each stop for photography made hiking out in the dark more likely. A few miles in, we all realized that there was no way we would finish so we packed up our camera gear and focused on hiking instead (and still hiked out in the dark). When I did stop for photography, I felt frenzied, made technical mistakes, and knew I was passing up opportunities at every turn. We all separately returned to this same canyon for extended explorations but left the time crunch and goal of hiking the whole thing behind. This slower pace made for better photography because it opened up time for exploration, working scenes more thoroughly, seeking out opportunities, and allowing space for photographic insights to occur. Of course, a slow pace isn’t always possible, like when photographing fast-moving light, but often, a slower pace is possible. We just need to give ourselves permission to explore without an agenda or self-induced time crunch and see what opportunities materialize once given the opportunity to be more immersed in a place. 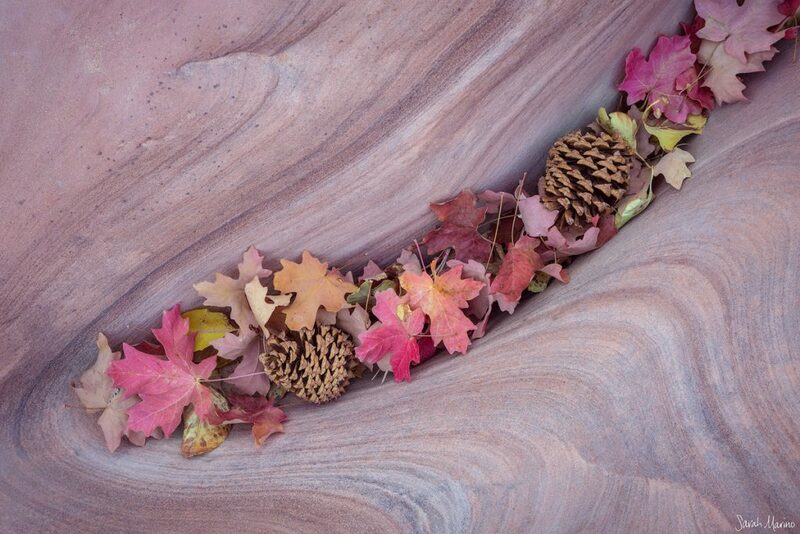 Maple leaves and pine cones rest in a small sandstone channel at the end of autumn. As I mentioned above, wandering around is an essential part of my photography practice. This means that I often arrive at a place with no specific plan in mind. Instead, I will walk around and see what catches my eye. I walk at the pace that my interests dictate, sometimes traveling a long distance between photographs or not taking out my camera at all and sometimes making it no more than a few hundred yards from my car or campsite over the course of an entire afternoon. Through these wanderings, I spend time seeing what is around the bend, at the top of a hill, down by a river, or along a trail. I strive to notice all sorts of details, from the quality of the light to how the weather might be changing to the experience of the full landscape to seeking out the smallest of details. Simply, cultivating curiosity, improving your visual observation/inventory skills, and spending time exploring a place is a practice that leads to photographic insights and opportunities. The example of my visit to Badwater Basin shared at the beginning of this article is instructive. During that visit, we spent a little more than an hour out on the salt flats – enough time to walk out before sunrise, scramble to find a composition, photograph for about a half an hour, and then walk back to the car for the drive to the next spot. The resulting photograph is a standard rendition of this spot – salt polygons with a pink sky overhead. In subsequent visits to this area, I have allowed myself hours at a time to explore without a goal in mind. During these explorations, I have found fascinating brown polygons, surreal mud tiles, delicate salt crystal formations, pools of blue water, and patches of intensely colorful rocks among many other potential subjects for photography. By allowing time for wandering around and studying a place, I found many more subjects for photography than I ever could with my previous rushed approach. 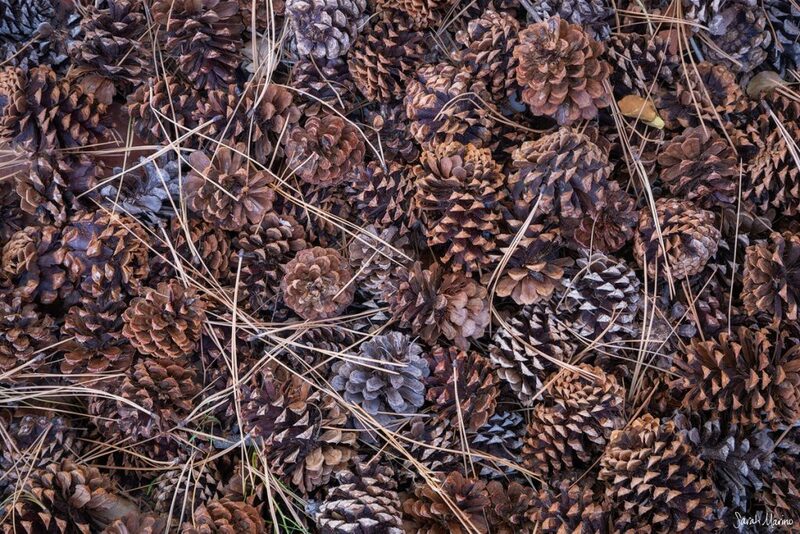 Pine cones and pine needles below a massive ponderosa tree. This idea is perfectly applicable to nature photography because it helps address two common laments: first, the feeling of not being able to get out enough due to the constraints of life (work obligations, family, lack of funds for grand adventures), and second, the significant pressure that a photographer thus feels once they are able to get out on that one-time-per-year grand adventure. By embracing the idea of micro-outings and integrating them into a photography practice, a photographer can relieve some of the angst about not getting out enough and relieve some of the pressure when big trips do come around. In my case, I started photographing my local botanical garden on a frequent basis and hiking the trails at nearby state parks and nature preserves. Although the scenery wasn’t always conducive to photographing the expansive landscapes I was pursuing at the time, the practice of getting out on a regular basis for photography made my more substantial photography trips feel less consequential. After consciously integrating micro-outings into my photography practice, I became better about allowing myself to take a slower pace and no longer felt as much pressure to get results when I invested time or money in a bigger trip. These micro-outings also offered another significant benefit for photography: they helped stretch my creativity and extended my ability to make photographs in a diverse range of natural settings. 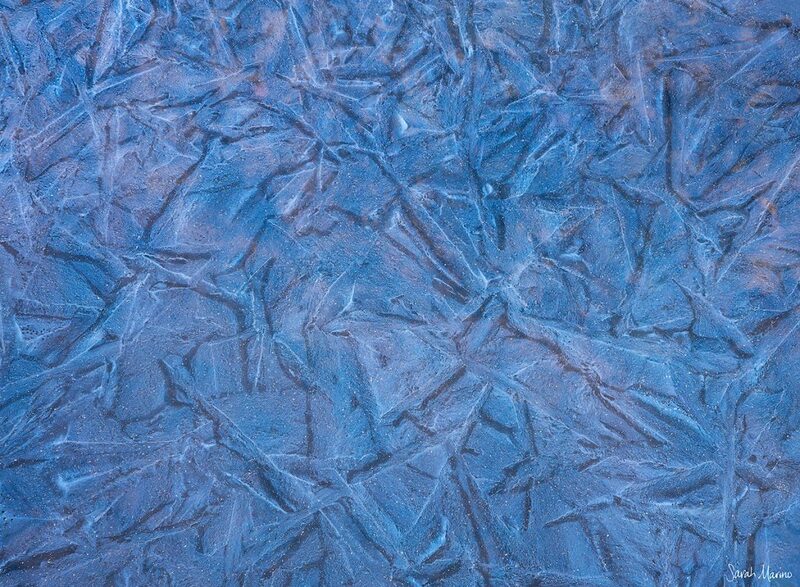 Ice patterns form in a sandstone pothole after a cold autumn night. After four years of taking a slower pace with my photography, my portfolio is a better reflection of both me and the places I visit. I feel more fulfilled, make fewer technical mistakes, and know the places I visit on a much deeper level. If you have worked to integrate to slower, meditative, or more contemplative approach in your own photography, please share your experiences below. What practices have worked for you and what advice might you offer for a photographer interested in giving some of these ideas a try? And if you found any of these ideas helpful or worth trying out for yourself, please let us know in the comments below.